Few electronic music genres fail to benefit from the pumping, sucking sound of side chain compression, yet it is one of those effects which many new producers struggle to get to grips with – not least because there are so many different ways of achieving it. Finding the easiest method has troubled me for a while, but thanks to a recent issue of Future Music, I now have just that and feel it worth passing on to anyone who cares to read this blog. I won’t bother explaining what side chain compression is. Partly because it’s almost impossible to put into words and partly because, if you’ve reached this page, there’s a damn good chance you’re familiar with it anyway. If you’re not, listen to the opening few bars of Eric Prydz’s Call On Me. The ‘ducking’ string sound at the beginning is probably the most commercial example of it. 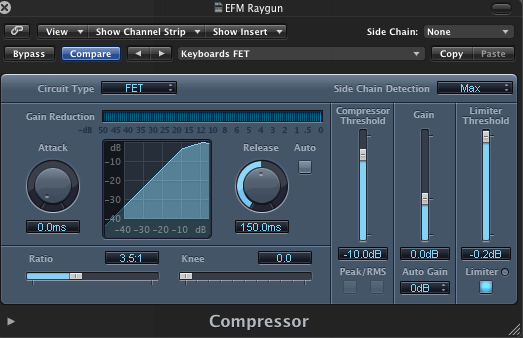 The tutorial I’m using is based on Logic Pro and its bundled compressor, but the same principle will apply for most DAWs. It also assumes a fairly good working knowledge of Logic. Make sure you set this all up in your standard template so it is always present for every project you start. The key is to create a hidden, silent, infinitely looping midi track. Pick a sound or single hit, although don’t be naturally tempted to reach for the kick drum bank – a tight hi-hat or short, snappy snare will actually do the trick better. These types of sounds are far tidier, frequency-wise and will ensure that they trigger a clean side chain signal when played. It’ll probably also help here if you boost some of the mid and top end and roll off some of the lower frequencies in the EQ. Stick your chosen sound on a four bar loop and loop infinitely. Depending on what type of sound you’ve picked, you may need to whack the level up to get a good signal, but I’ll let you be the judge of that. Regardless, this can be tempered for each project, depending on how severe you want the side chain effect to be. Send the output of the track to a bus and mute the bus track. To keep things tidy, hide the track you have the looped four bar hit on by clicking the ‘H’. That’s your side chain trigger set up. Simple as that. Now, whenever you want to squash the bejesus out of a synth patch, for example, add a compressor to the track in question and choose bus 3 in the Side Chain drop down box at the top right. Bring the compressor threshold way down to -30-40dB, the ratio as low as you like, knee at 0 and bring both the attack and release down to around 10ms. Adjust as you see fit. As with many side chain tutorials, the above may seem complicated at first, but this is in fact the simplest method I’ve found yet. Have fun.